We bought toothbrushes. Expensive ones. Ones with fancy settings, multiple toothbrush heads, even a sanitizer. We spent over $200 on our toothbrushes! There, I said it. Who does that? You could buy so much with $200 or pay down some debt. We do, obviously. Why? Thanks for asking! Let me give you a short back story (not sure if short is in my forte, but I’ll do my best). I talked about Anna’s dentist trip awhile back and our history of the dentist but now about our toothbrushes. Exciting, I know! Growing up we both just had your run of the mill manual-brush your teeth for 20 seconds so your breath smells of toothpaste so mom will think you brushed your teeth-toothbrush. Gary and I had different dental experiences growing up but in the end when we got married and were talking about having kids, we had to start a routine of going to the dentist. 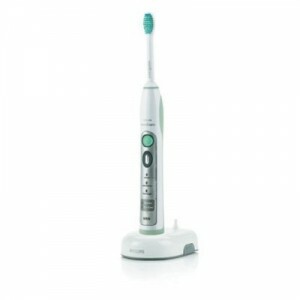 So we started out with the 2 for $10 Oral B and Crest Spinbrush battery operated toothbrushes. They were great when we compared to our manual ones. They got me through years of no cavities. Then we decided it was time to upgrade only because Woot told us we should. On one particular day they had a Two for Tuesday of nicer Oral-B (I think) rechargeable toothbrushes for about $45. Perfect! Those worked great for about a year or so until mine wouldn’t hold a charge anymore and Gary’s was running out of gusto. So we tossed those. We hemmed and hawed for months on getting the best out there. So in the meantime, we went back to good ole manual and tried to brush for 2 minutes but it just wasn’t the same. Our dentist appointments came around in November and there came our decision maker. Well for me anyway. I was on about year 4 of no cavities, no nothing. Then I was hit with 2 cavities. Granted they got this new fancy light that detects cavities even sooner than x-rays, but still…. And for Gary, he’s been cavity free for awhile but continues to battle with gum issues and other past neglect due to no insurance as a young 20 something. Since then, he’s been the model teeth guy, brushing twice a day, mouthwash twice a day, flossing each night. Gold star for the Gar! Which brings me into our $200+ toothbrush purchase. 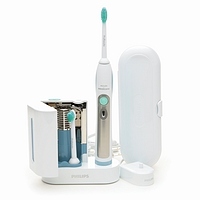 Enter the amazing-feels like you walked out of the dentist and more everyday-5 settings-sanitizer-rechargeable-not terribly cheap replacement heads-but so well worth it Sonicare FlexCare Plus and FlexCare (for me). These toothbrushes have a 2 minute cycle with a 30 second buzzer to change zones so all your teeth get the same amount of attention. They vibrate instead of spin and clean between your teeth to almost feel like you flossed. So not to be dazzled by the features of the brushes, they were really to bring our teeth and gums back to where they were and hopefully a lot better! Our perio charting which shows how healthy your gums are should be out of the 3’s, 4’s and 5’s and down into the 1’s and 2’s. All in all this was an investment into better dental care, to save us from awful root canals and cavities and the biggest one, their bills, in the future. A remarkable difference from past toothbrushes, especially this last one, is what we’re hoping for come May/June!